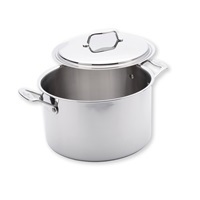 A lifelong addition to your kitchen, the 3 Qt Stock Pot with Cover is the perfect size to make authentic Italian pasta sauces like vodka sauce and alfredo sauce. Each individual pan is hand polished to a mirror shine, providing a stunningly rich appearance in the kitchen and on the table. 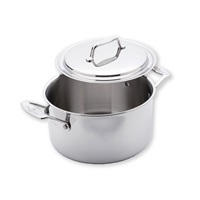 With the 5-ply stainless steel 4 Qt Stock Pot with Cover, enjoy savory, homemade soups like hearty chicken noodle soup, creamy tomato bisque, or delicious French onion soup from the comfort of your home. 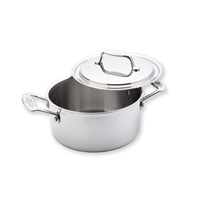 The USA PAN 5-ply Stainless Steel 8 Qt Stock Pot with Cover is premium cookware that is perfect for your sauces, soups, and bisques. Each lid cover features a vapor seal design which seals in flavor and essential vitamins and nutrients in your sauces, broths, meats, and vegetables.